Muslims throw firebombs at Jewish school, syangogue, during protests against Tunisian government. 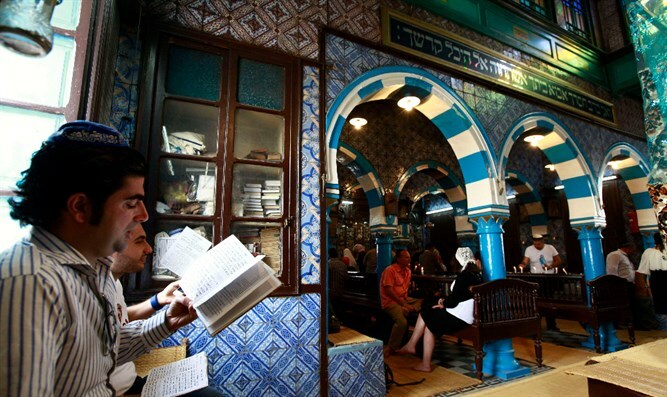 The El Ghriba synagogue, located in Tunisia's Djerba Island, was attacked on Tuesday night by Muslims throwing firebombs. The Muslims were protesting the Tunisian government. No one was hurt, but the synagogue was damaged. Separately, firebombs were thrown at a Jewish school in Djerba. There have been no reports of injuries, but the school itself was lightly damaged. Recently, violent protests against the Tunisian government have been held, with demonstrators protesting into the night against the country's economic entanglement and price rises. On Monday, one person was killed in a clash between security forces and protesters west of Tunis. The victim suffered from breathing problems, and choked after breathing in tear gas. A Channel 2 report quoted eyewitnesses as saying that the protest turned violent when security forces attempted to prevent several youths from burning a government building. Five people were injured in the clashes, and taken to hospitals for treatment.